The Stelvio Pass tops out at 2757m / 9045' and is the second highest paved pass and fourth highest paved road in the Alps. The Stelvio is the highest pass on any cycling Grand Tour, is frequently featured in the Giro d' Italia, and is also widely regarded as one of the best mountain roads to bike or drive in the Alps. Woke up 3 am this morning, which unfortunately is not too unusual. I had a croissant and some juice for breakfast, then left the hotel shortly after 7am. This bike had 2 gears in front and 11 in the back, I'd never heard of such an arrangement but I pay zero attention to road bikes considering how much time I spend on my mountain bike. I was into my lowest gear within a mile or two, that did not bode well for my chances for the day. I wasn't worried about getting lost because every roadsign mentioned the Stelvio. Note the bright orange photoradar cop next to the road. I'm turning left at the roundabout to head south. There's not much to see of this town that's not in this picture. Just left Spondigna / Spondinig, now looking south toward the Stelvio. After I passed through the town of Prato Allo Stelvio / Prad am Stilfserjoch I saw a couple of people parking their cars and getting their bikes ready for the climb. I was still plenty early, I didn't see any other bikes yet. I made my first stop here. Two years ago I had climbed the Alpe d' Huez without stopping, but since the Stelvio was about twice as high and twice far as Alpe d'Huez I had no delusions that I'd be able to climb it without stopping. I believe that's Campo Glacier but I'm not sure, there ware too many peaks in this area. The large peak to the left is not one of the high peaks, higher peaks are in back of it. Ortler / Ortles 3905m - 12,812', the highest mountain in the Eastern Alps outside the Bernina Range, and the highest point in Tyrol. I didn't see many boring cars on the Stelvio. The sign on the left was all over the Dolomites and this area as well encouraging motorcyclists not to accidentally kill themselves by flying off the road over (or into) a cliff at high speed. Turn 24, approaching Berghotel Franzenshöhe, which is at turn 22. I stopped at Berghotel Franzenshöhe for a break and something to eat - I was famished. I went inside and looked for some snacks, and found none. Apparently they only had table service outside. There weren't many good places to pull over and get good pictures, especially on the corners. This corner had a decent sized parking lot so I stopped for a break and pictures. A group of several cyclists who were coming down the Stelvio speaking Italian also took a break here, and one of them got my picture. This turned out to be the only Italian I heard either today or anywhere in the mountains around Bolzano. Toward the top of the Stelvio two different groups had spray painted mileage lines on the road for each of the last 7km on the way up. Their kilometers disagreed by perhaps a hundred meters or so, not a significant difference. He's a British born American currently residing in Florida. (After checking his website, he's got perhaps 20x more pictures of motorcycles than cyclists - I guess there really were hundreds of cyclists up there). He also said that some people - espeically larger folks - frequently get altitude sickness just by motorcycling or driving up the Stelvio. I got to turn 1, and it was still nearly perhaps half a mile or so to the pass. That was a very last segment, but I made it. 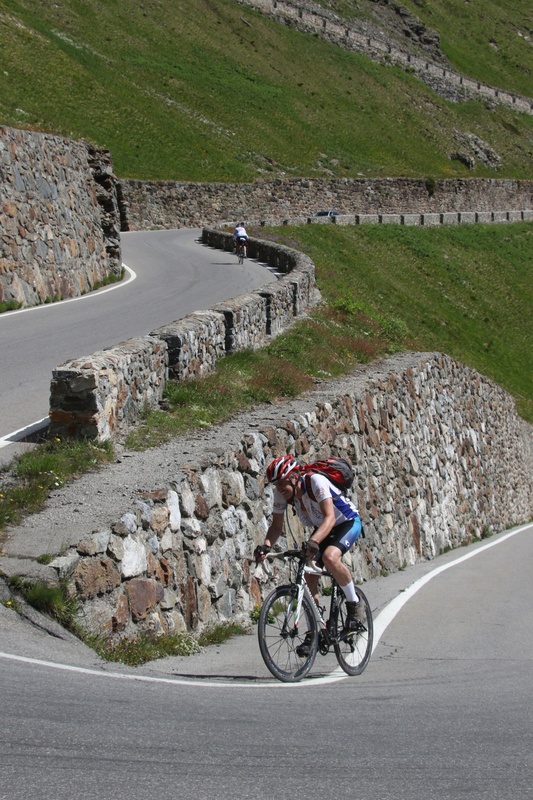 A rush of adrenalyn and bliss hit me as I pedaled the final feet to the very top of the pass. It took me about 4 hours and 40 minutes to get up the Stelvio including much needed breaks. The top had about 6 different carts featuring pretty much the exact same fare - wieners, beer, and sodas. I picked the wiener guy nearest the edge / view and wolfed down a wiener and a beer, followed up eventually by a coke. I was moving very slowly but that was ok, I was still moving, I'd made it, and it was (nearly) all downhill from here. I shopped for cool souvenirs but didn't find anything that really interested me. I really want another long sleeve cycling jersey. I asked at all the stores, one store suggested one of his competitors but also advised me to avoid most of the other stores because 'their jerseys are only for souvenirs - you'll sweat', meaning they're made of the wrong material. I ended up staying on top for about an hour and ended up buying nothing but the food and beverage I consumed. At the top someone told me that my Colnago was a great bike - I don't think he understood enough English to understand when I told him it was a rental. Two years ago a fellow cyclist had also commented that my Scott rental bike on Alpe d' Huez was a great bike.. I turned out that the short bike was not a big problem. Ibuprofen kept the pain away on the ride. I needed a nap more than anything. Real cyclists do more than one climb in a day like the Tour de France cyclists, I have no such ambitions. Looking west from the top of Stelvio toward Umbrail pass. The road downhill is in Italy, but the mountainside just uphill of the road on the right side is in Switzerland. At the time I knew I was close to Switzerland but didn't know how close. On the way down I stopped and took lots of pictures at turn 1 since there's plenty of room to do so, and you also have a fairly good view of all the hairpins. It look longer than I would have liked to get back to town. I got back to Silandro / Schlanders at about 2:45pm. I turned in the bike, hobbled back to the hotel, and collapsed. Bormio, the town at the base of other side of the Stelvio, is on the lower left. Very very very buttery yummy!